Ajamila was once a religious brahmana engaged in Shaligram worship and had actually developed a significant amount of bhakti (devotion) for Narayana by so doing. But then, by the play of the planets dispensing the fruits of karma at their appointed times, he came due for a sinful detour. He abandoned his devoted wife and children and become the fool of a prostitute who he gave everything to. 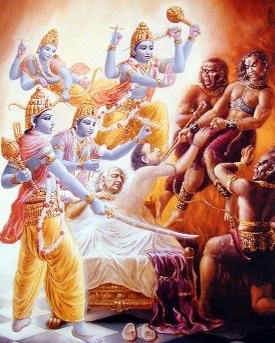 Why is it that this wretchedly sinful man was able to call out to Narayana by a twist of fate with his dying breath, and why did that coincidental call attract the mercy of Narayana, who dispatched his angels to rescue Ajamila from the servants of death? The answer is that although Ajamila became a man of “sin” he never once became a man of “aparadha.” There is a HUGE difference. Moral life and spiritual life have a lot in common but they are not identical, as Ajamila’s story illustrates. “Sin” means to do things that are morally forbidden to ones social role. “Aparadha” means to dislike Godhead. Sin creates bad karma, that is true. But bad karma cannot block the transcendental results of divine love (bhakti). Therefore all of Ajamila’s immorality did not really pose any significant threat to the status of his affection for God, Narayana. Aparadha (“offense”), on the other hand is the only thing that can stand in the way of divine love (since by definition it is the negation or absence of divine love). To be a murder, thief, adulterer, and all around villain? Or to be a flawless moralist who thinks that a personal God is a bother and the lovers of that god are bothersome crackpots? If you want good karma, it is worse to be a villain. But if you want divine love it is worse to be the moralist who hates the divine person. Then perhaps the lovers of Krsna are free to be immoral? No, since love of Godhead is the purest state of spiritual being, morality and purity are the natural and normal side-effect of love of Godhead. The normal state of a bhakta is natural moral purity. However things are not always normal. Sometimes abnormal things happen. Thus sometimes, by twists of fate, some bhaktas become immoral. Ajamila was one of those outstanding cases. As long as our horrible behavior does not change our attitude of loving Godhead, these sins are not serious impediments to the progress of Bhakti-yoga. What usually happens, though, is that we don’t want to admit that we are immoral. We justify our immorality. “I may be bad, but I am a devotee!” Or, “I can continue being a villain because I love Krsna” – This justification is itself an aparadha. Thus it ceases to be a relatively harmless moral sin and becomes a negation of divine love! Aparadha means the antithesis of love. Love means to please the beloved. To say, “I can continue being a villain because I love Krsna” is an aparadha because it employs Krsna in my own service, “Krsna will pay my bail.” Thus it is the opposite of love – it is selfish lust. To use others for ones own satisfaction is lust. To please others for their own satisfaction is love. To use Krsna as a vehicle for being a villain is itself an aparadha – which is far worse that whatever villainy one is trying to justify. The clue here is not to obsess over morality or religiosity, but to obsess over selflessly loving the Supreme Personality of Godhead. One who has that obsession is guaranteed transcendental success, even if they make a moral train wreck of themselves – as I myself am always so prone to do.